Set in the heart of the Garden of England, Tudor Park Marriott Hotel & Country Club is perfect for a country retreat for golfers living and working in London. Featuring a stunning championship golf course, golfers will be treated to memorable golf holes and sweeping views of the Kent countryside. Tudor Park Marriott Hotel & Country Club is located on the outskirts of Maidstone, allowing easy access from most of the UK. When you reach the enchanting estate, you can relax in the spacious bedrooms before taking full advantage of the facilities, including a spa, swimming pool, and the delightful Cast Iron Grill. The course itself is not particularly long at 6,041 yards, but it was designed by the legendary golf architect Donald Steel, so what it lacks in length it makes up for in quality. Accuracy is of paramount importance around Tudor Park, as the network of streams and the predominant mature wooded areas ensure that there is no shortage of obstacles. Tudor Park boasts top of the range practice and tuition facilities which are ideal for improving your game. 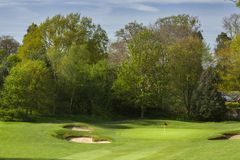 The 120-bedroom hotel at Tudor Park Marriott Hotel & Country Club is set amidst the stunning Kent landscape and is an extremely welcoming haven for the travelling golfer. The spacious guest rooms benefit from individual climate control, luxurious bedding and a workstation, while all are tastefully decorated to ensure visitors a pleasurable stay. Guests will enjoy views over the golf course and the manicured gardens of the courtyard, while the warm welcome and considerate service are guaranteed. The package is completed by the tremendous amenities and facilities, making Tudor Park Marriott Hotel & Country Club a great choice for your next golf break. The Fitness Centre at Tudor Park Marriott Hotel & Country Club includes an indoor swimming pool, sauna, steam room, spa pool, gymnasium and tennis courts, while there is a crèche to allow parents to take full advantage of the facilities. Tudor Park Spa offers speciality health and beauty treatments that include body wraps and scrubs, facials, manicures, pedicures, massages and waxes. Zest serves satisfying classics overlooking the golf course. Very nice time was had by all our party, the rooms are comfortable, clean and spacious. Staff were excellent, friendly and helpful. Hotel, again comfortable, seating everywhere. Hotel was perfect for us - everything went smoothly, rooms were nice, breakfast was excellent. As you'd expect, being a Marriot hotel, everything is in good condition and the staff in particular were really helpful - from check in at reception, through to the golf shop and the restaurant staff, nothing was too much trouble. Evening food was excellent with a huge range available at Breakfast too. A fantastic night away. The staff were superb and the golf weekend was great value for money. We thought our 'Sunday Special' golf break of accommodation, 2 rounds of golf and 2 meals, as well as use of the facilities (pool and gym) at the hotel was wonderful value for money. The staff were courteous and extremely helpful, and even the weather was on our side, showing the golf course in all of its autumn splendour. The greens / fairways / aprons / tees were all well attended and we had no other issue's what so ever. We were paired with a couple of members (Tim and Sue) for our first round and they were a delight, showing us the way round the course which makes life so much easier first time round. Not to be over looked either, yourgolftravel were great and arranged everything as they said they would. With the cost of the trip in mind, I’d have to give it 10/10. I like this course, there are some very interesting holes and it is a course for all standards, at this time of the year a bit bear and the fairways have not recovered from our fabulous summer. Greens were not the greatest, hollow timing was evident and the greens were quite bumpy to say the least, but again time of year doesn’t help. Would like to play it again in the Spring / summer. Greens in great condition despite rain, fairways were fine despite heavy rain in the days before. Loads of leaves but not much you can do about that! Quite a few blind tee shots, which for mid-high handicappers who were unfamiliar with the course, made it a little daunting! A few times, what appeared to be good shots from the tee were actually in trouble, but by the second round, we knew where more of the misses were and adjusted accordingly. Greens and overall course condition was excellent. Greens on the whole are tight with most well guarded, but a nice range of holes across a course that did seem busy but flowed well on both days. Range was good, but bear in mind it is only a 200 yard range, so irons only and I'd have preferred to have been able to knock some rust off the driver before taking on the course!